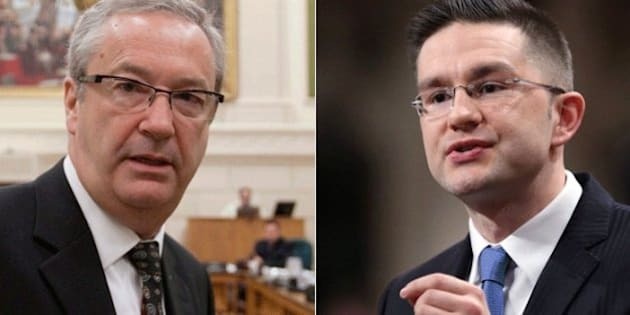 OTTAWA - Democratic Reform Minister Pierre Poilievre is fending off near-universal condemnation of his controversial elections overhaul by attacking the integrity, impartiality and motives of the chief elections watchdog. Exactly four weeks after he launched Bill C-23 with a swipe at Marc Mayrand for "wearing a team jersey," Poilievre accused the chief electoral officer of making "astounding" and untrue claims about the legislation in a desperate bid to pad his power and his budget. "His recommendations really boil down to three broad requirements for him," Poilievre told the Senate legal and constitutional affairs committee Tuesday as it launched a "pre-study" of the bill before the House of Commons considers amendments or passes it. "He wants more power, a bigger budget and less accountability." The broadside drew sharp condemnation in the Commons during the daily question period. "Will the prime minister stand in this House and apologize to parliamentarians, and apologize to Marc Mayrand, for that cowardly, baseless attack on Canada's chief electoral officer?" NDP Leader Tom Mulcair demanded. Stephen Harper responded by congratulating Philippe Couillard, the Quebec Liberal party leader, for his victory Monday night in the provincial election. Poilievre stood by his morning testimony at the Senate committee. For his part, Mayrand refused to respond in kind. Appearing later at the same Senate committee, he attempted to keep the focus on the sweeping changes he and other electoral experts fear will disenfranchise tens of thousands of voters, erode the independence of Elections Canada, slow down investigations into breaches of election law and make spending limits on political parties unenforceable. "My role is to point out to Parliament some issues that may arise from any legislation that governs elections," Mayrand said outside the committee room. "I think that's my duty, my responsibility and I'm trying to fulfil it to the best of my abilities." Mayrand has long been a favourite target of the Conservatives — and Poilievre in particular. Poilievre and other Tories repeatedly accused the Harper appointee of singling out the Conservatives for electoral wrongdoing in the so-called in-and-out scandal while ignoring similar transgressions by other parties. The governing party was eventually convicted in that affair of having orchestrated a scheme to exceed its campaign spending limit in the 2006 election by more than $1 million. Poilievre insinuated Tuesday that the agency is equally misguided in pursuing an investigation into automated phone messages that misdirected thousands of primarily non-Conservative voters to the wrong polling stations in the 2011 election. Elections commissioner Yves Cote has testified that the robocall investigation has been frustrated by unco-operative witnesses and has asked for the power to compel testimony. But Poilievre said police manage to secure convictions without that power, and "if Elections Canada cannot do the same, perhaps that says something about the cases being investigated, rather than the powers of the investigator." Two representatives of the federal Competition Bureau told an evening committee of MPs that they "regularly" use their power to compel evidence with a judge's order — 26 times last year. "It ensures information is brought to us in a timely manner and that the information is complete," said Richard Bilodeau, a deputy commissioner in the civil matters branch. Sheila Fraser, the highly respected former auditor general who uncovered the previous Liberal government's sponsorship scandal, told the Commons committee her former office also has the power to compel testimony, although she never had to use it. Fraser also rose to the defence of Mayrand's integrity and impartiality, while giving a sharp blast to Poilievre for his public treatment of an officer of Parliament. "We don't take these jobs to win popularity contests. We do our work with objectivity," she said at the evening Commons committee. Moreover, she said the attack on Mayrand raises concerns for all seven independent officers of Parliament, including the auditor general. "This serves none of us well. It undermines the credibility of these institutions and at the end of the day, if this was to continue, we will all pay because no one will have faith in government, in chief electoral officers or our democratic system." In remarks to reporters, Fraser said she has always found Mayrand to be "very honourable, to take his job very seriously." Preston Manning, the former Reform party leader, appeared by video conference and also criticized Bill C-23's move to muzzle the chief electoral officer, although he had kinder words for other aspects of the legislation. "I would like to see the role of Elections Canada and chief electoral officer strengthened with respect to the promotional and educational activities needed to increase voter participation," said Manning. "It seems to me that the biggest challenge with the Canadian electoral system is not its fairness — although one has to address that — but it is this declining participation in elections generally."